For over 30 years Clark the Carver of Carve Me A Bear! 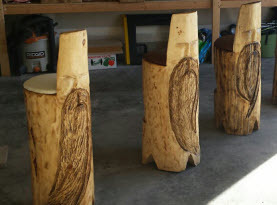 Chainsaw Carvings has been mastering his talents and skills with a chainsaw, and creating profound works of art with a chink of wood, his modified chainsaws, and his creative skills. 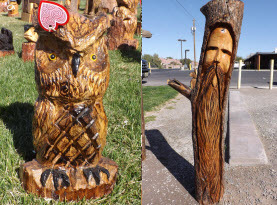 Based in Las Vegas, Nevada and Helena, Montana (depending on the time of year), Clark the Carver has designed totems, tikis, animal sculptures, wizards, gnomes, name signs, furniture, memorial planters, and so much more. We take custom orders, or you can select one of our finished sculptures. Included in our custom orders is our custom chainsaw carved wood name signs. Having a custom name sign can apply to residential homes, commercial businesses, and even community parks or recreational establishments. With extraordinary craftsmanship, Carve Me A Bear! Chainsaw Carvings can custom design your sign. A perfect gift for weddings, anniversaries, or someone getting their first small business up and running, these clever custom name signs are the perfect addition. Investing in a rustic custom, chainsaw carved sign for the recreational parks or community areas can be a pleasant reminder of landmarks, or even rules. 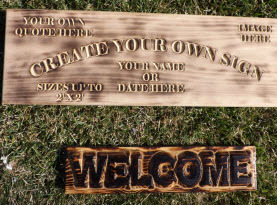 Ideas for owning or gifting a custom name sign from Carve Me A Bear! Chainsaw Carvings is virtually endless. On a wedding day, proudly displaying the surname of the newly joined couple; or an established family on an anniversary, can be extreme sentimental. Adorning the exterior home on the door or yard, or perhaps on the interior welcoming guests in the entryway or even above the fireplace, you can have your custom name sign hung or placed in your own home; or as a treasured gift to a loved one. Clark the Carver can create name signs that fit your home’s décor or your sense of style. Rustic appeal, elegant wisps, hyperactive fun, whatever the case may be, we can make it happen. Additional name signs can be for the nursery or older children. Designing a chainsaw carving of their name, perhaps their birthday, whole or part, adding a place to insert feet and/or handprints, or other special engravings can be just the right touch in any child’s room or nursery. Commercial businesses in the Las Vegas Valley can easily have a custom name sign carving from Carve Me A Bear! Chainsaw Carvings. For example; adding a custom sign in your window that grabs the attention of people passing by can entice them into your salon, dojo, or retail shop. Gift an extraordinary menu board for a family member or friend to add charm to their cupcake boutique, café, or small restaurant. Feasibly, your boss could use a clever name sign for their office or when to mark the anniversary their business got started. There are countless ways a custom name sign for your home or business can be used in your home, business or property. 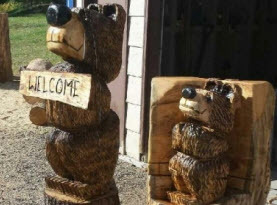 Whether you want to treat yourself, or get a unique gift for a loved one, Clark the Carver of Carve Me A Bear! Chainsaw Carvings can carve the custom name sign you have in mind. Call us today to get started!